PicoSteady, an iPhone and DSLR camera stabilizer: get ready, videomakers! London Olympics 2012: plenty of iOS apps to follow the games - and have fun! KurbKarma: the parking app we've all been waiting for! No parking? No fear! Now there's KurbKarma, the iOS app that will find a suitable parking near you! (Right now it's available just for NY and SF city areas but it's quickly expanding to most other cities.) Download it now for free on iTunes Store. FontBook is the world’s most comprehensive reference on digital typography. It documents the work of 118 renowned international type foundries, representing 1650 type designers, constituting 35,000 fonts from 8050 font families (status: April 2012). The FontBook app presents this selection through 700,000 typeface samples which can be intuitively spread out, searched, layered, moved, scrolled and combined like a collection of maps. Get FontBook for US$ 5.99 on iTunes. Checking on Kickstarter, the universe of cool ideas, we found the PicoSteady. A video camera stabilizer for iPhones, Smartphones, Point-and-Shoot cameras, and DSLRs. It will work with almost any camera including: point-and-shoot cameras, GoPro cameras, the iPhone, and most smartphones. It also works great with DSLR’s like the Canon T2i or Nikon D5100. The standard 1/4-20 thumbscrew will allow you to mount most cameras and the included universal smartphone holder will allow you to use the Picosteady with any smartphone or iPhone. Its ultra light weight (6.5 oz/180 g) and very compact size (5″ x 6.5″) means you’ll actually carry it with you, greatly improving any footage you shoot, from home video to amateur film. It will retail at $179 (right now, it is available for kickstarters at a lower price of $139, so hurry up!). 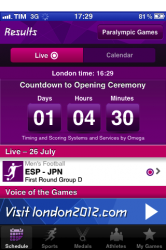 London Olympics 2012: plenty of iOS apps to follow the games – and have fun! The 2012 Olympic Games begin in London, England on July 27th and run through August 12th, 2012. Opening ceremony will start today at 9PM (London time) at the Stratford Olympic stadium, well-known director Danny Boyle is in charge of directing the show. In order to follow all sport events with our beloved smartphones and tablets, here are the three official apps available for Android (being Samsung the London 2012 main sponsor), iOS, Blackberry and Windows Phone. The Join In App is the official guide to all venues, places and stadiums as well a precious source of informations about access & tickets. It’s available for free for Android, for iOS (iPhone and iPad) and on Blackberry. The Results App is the medal score board timely updated, so that you’ll never miss who’s winning a specific sport event any time! 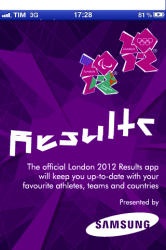 In fact, the Results app is the end-point of all the IT infrastructure behemoth behind London 2012. Again, it’s available for free for Android, on iOS platform (iPhone and iPad), for Blackberry and for Windows Phone 7. Those who were left at home and are not going to participate to the real games, may try the Game app! 9 Olympic events: 100M, 110M Hurdles, 100m Freestyle, Double Trap, Triple Jump, Pole Vault, 100m Butterfly, Kayak (K1) and Archery. Oh, by the way, you have to train your virtual athlete! The Game app costs 0.79 Eur for iOS and it’s available on iTunes Store. KurbKarma: the parking app we’ve all been waiting for! Now there’s KurbKarma, the iOS app that will find a suitable parking near you! Download it now for free on iTunes Store. FontBook is the world’s most comprehensive reference on digital typography. It documents the work of 118 renowned international type foundries, representing 1650 type designers, constituting 35,000 fonts from 8050 font families (status: April 2012). The FontBook app presents this selection through 700,000 typeface samples which can be intuitively spread out, searched, layered, moved, scrolled and combined like a collection of maps. Get FontBook for US$ 5.99 on iTunes. As European Soccer 2012 Championship is approaching, get a grip on Blast Ball by Uncade LLC, a strange soccer game for iPhone and iPad where you’re supposed to score as much goals as possible with no care of what you’re throwin’ in! You’ll be kicking not just regular soccer balls but a complete weird inventory of funny stuff, including bombs. 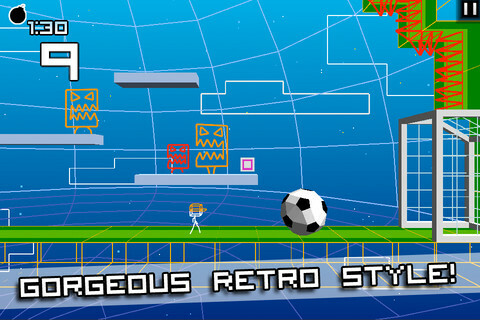 With a retro look and strange graphics, Blast Ball is definitely worth a try! Blast Ball is available on iTunes Store by clicking here! ThePhotoMaster.com Digital photo news, digital cameras reviews, imaging technologies and fun! Flipboard app for iPhone: social media browsing easy on iPhone too - at last! Mobile warriors survey: pretty interesting results - and plan to get an iPad! iPhone, iPod, iPod touch, iPod nano, Safari and iTunes are registered trademarks owned by Apple Computer Inc. | theIfile.com is not produced or endorsed by Apple Computer Inc. | All other products names and icons are trademarks of their respective holders.